Roast all ingredients except nutmeg and turmeric powder in a dry pan for few minutes till slightly brown and fragrant. Leave to cool slightly. Add grated nutmeg and ground to a very fine powder in a grinder. Mix in the turmeric powder. Leave to cool completely before storing in air tight container/jar. ** in some traditional recipes, many use white poppy seeds but I find this did not add any value to the dish and it can be gritty if not blended very fine. ** some recipe add fried mustard seeds in oil, I find this unnecessary as the dish is already very rich and full of flavour without the mustard oil. - Rub spice powder and salt onto meat and leave to marinate for few hours. - Heat oil/ghee in a large pan till hot, throw in the curry leaves to sizzle for about 10 seconds, add onion, ginger and garlic paste and stir fry for about 5 - 10 minutes till the paste is reduced slightly and thickened. - Add meat and brown for about 10 minutes, stir to prevent burning. - Add about 1 ½ cups of water and simmer at low heat with lid on for about 1 hour till meat is tender. If the meat is getting dry during stewing, add more water. - Add coconut milk turn heat up, when boiling add Spanish onion and cook for few minutes, then add cooked potatoes (if using) and simmer till potatoes are warm through. - While the onion is cooking, blend cashew nuts and milk till very smooth and thick. Scrape into a bowl and add lemon juice to let the nut milk curdles. Add this to the kormah just before ready. - Stir in chopped coriander and chillies (if used). Ready. If you can wait till next day, this curry will taste even better. If not dish up and sprinkle on some chopped coriander. 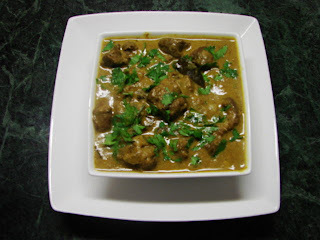 ** You can use other meat like stewing beef or chicken, just adjusts the cooking time to suit.